Cassidy McFadzean’s poems have appeared in magazines across Canada including The Malahat Review, Grain, Arc, Vallum, and The Fiddlehead. 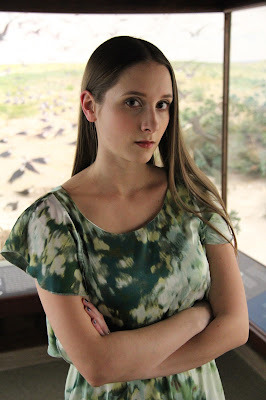 In 2012 she published a chapbook, Farwell with JackPine Press and in 2013 she was a finalist for the CBC Poetry Prize and the Walrus Poetry Prize. She was born in Regina and studied at the University of Regina and the Iowa Writers’ Workshop. Hacker Packer (McClelland & Stewart, 2015) is her first collection of poems. So much of writing is slow, solitary work. Thinking of my book as an object in the world has given me the feeling that that this thing I do everyday can exist as something visible too. I haven’t been at it long enough to really compare my older poems with newer stuff, and I think I’m working through a lot of the same ideas. I might be getting a bit more comfortable writing about my own life, which I really resisted at first. I’m drawn to the effects of compression and sound, which I’ve found can be accessed most immediately in poetry. I like short fiction for its similar formal intensity, but my attention, so far, feels most charged when writing a poem. I’ve experienced the occasional line entering my mind and a poem feeling intact after the first draft but it’s rare. Revision is when I feel most like I’m writing. I love the feeling of reworking a line, and returning to it again and again. That’s when most writing happens for me. Usually, I begin with something rooted in the world. A painting or sculpture, a voice or feeling I can’t work out. I don’t start thinking about a book until I have enough poems to start cutting. I enjoy reading my work aloud, though I get almost giddy with nervousness and anxiety beforehand. I’ve found that reading work-in-progress to an audience can be an excellent catalyst for revision, especially at the line level. When I’m working on a poem, my attention is focused on formal and aesthetic concerns, and I think for the poem to be successful for me, it has to be. It’s my hope that the theoretical questions that enter my poems— from questions of gender roles and class to ideas of mortality and metaphysics— will emerge from the personas, images, and sounds I invoke and not the other way around. I prefer approaching these ideas from a sideways glance, rather than head-on, but maybe that will change in the future. I most admire artists whose primary role is an artistic one. I find myself reading more closely the work of writers such as Alice Munro and Karen Solie who do not have a huge public presence outside of their work. What I gain from their writings are things like how we should live our lives, and what the role of art might be. I guess everything I feel is worth saying I want to put in my poems. Editors are the best oracles—they reveal my darkest fears about a piece, those things I didn’t want to admit to myself but know I must change. I’ve been thinking a lot about lines lately. One of my Iowa instructors talks about thinking in terms of the line, rather than line breaks. This has been helpful for me to consider, especially when most poets are no longer using meter to measure the line. I tend to follow my instincts, but if I read a line aloud differently from how it appears on the page, I feel suspicious of myself. Lucie Brock-Broido’s Stay, Illusion and Anthony Madrid’s I Am Your Slave Now Do What I Say are two books where the lines feel finely crafted in terms of both rhythm and idea. I’m finishing up my MFA, so I try to spend most of the day writing. I’m less distracted in the morning before I’ve had coffee and am still half-asleep. In the afternoon, I read, go to class, or teach. Reading is the obvious place, but the biggest one. There’s so much that others are doing with language that’s exciting. Kerry-Lee Powell’s Inheritance and Stevie’s Howell’s [Sharps] are two collections that make me to want to do more in my own work. My favourite smell is ozone, which always makes me think of my earth-home. On a smaller scale, I love the smell of lilacs growing around my parents’ house in North Central Regina. The visual arts are a huge part of my writing. I’ve written ekphrastic poems about The Unicorn Tapestries at Cluny, and at the Cloisters in New York. I’ve also written about Rodin’s sculptures, Hieronymous Bosch’s Garden of Earthly Delights, and the drawings of Canadian artist Shuvinai Ashoona. My father and brothers are visual artists, so maybe that’s where my interest stems from. Most recently: Ovid’s Metamorphosis, Rilke’s Duino Elegies and Sonnets to Orpheus, Jeramy Dodds, Thomas James, Amanda Jernigan, Mary Szybist, Emily Dickinson. Living in the US has introduced me to poets like Ariana Reines, Dorothea Lasky, and Heather Christle. I’d like to see more of the world. I’d like to return to places like Greece and Italy, but I’d also like to see the Maritimes and Canadian territories. I want to make time to work at my fiction and hopefully start publishing it. It would be nice to do something that doesn’t involve sitting at a desk. I went through a phase of wanting to be a stonemason, but totally romanticizing it. Maybe I was reading too much Old English poetry at the time. I think growing up surrounded by books gave me the feeling that such a life was possible. I always wanted to write. I stuttered from a young age and still do a bit, the kind where not only do the words not come out, but it feels like you’re drowning on air. I found it was easier to stay quiet, and from the age of 12-18 I kept a daily journal and read as many books as I could get my hands on. I found that in my writing, I could express things exactly the way I wanted to, the way I heard them in my head. People often talk about writing giving them a voice, but maybe my speechlessness gave me poetry. Ben Lerner’s 10:04 and Interstellar, which are both kind of about time travel. My second collection of poems, Drolleries, which takes its name from the marginalia of animal-human hybrids doodled in medieval manuscripts. I’m also working at finishing my MFA and moving back to Canada.